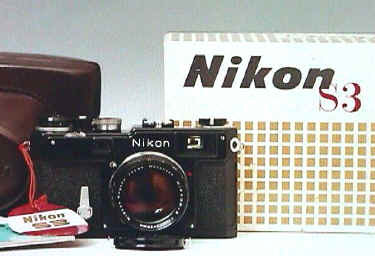 Nikon made a last series of S3 cameras for the 1963 Olympics, all in black. They came with a new improved version of the 50/1.4 which came to be known as the "Olympic 50/1.4". You can easily spot it because it is about 50% larger than the normal 1.4. Unfortunately over the years, the body and the Olympic lens are often separated. 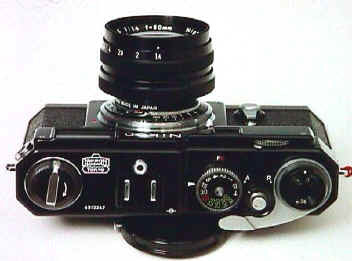 The S3 was a modified SP with a simplified finder system. They are actually built on the same camera chassis. The S3 has non parallax corrected etched framelines for the 35, 50, and 105. All framelines are visible at the same time. 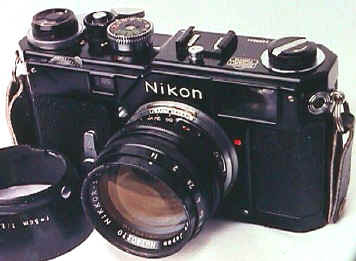 Like the SP, the S3 could take the Nikon Motordrive. Later S3's also have titanium shutter curtains, just like the SP's. The S3 could also take the SP exposure meter and EV case. The wear of the years has shown S3 finders much more prone to flare than the SP or the earlier S2. Revised: September 15, 2017 . Copyright © 1998-2002 Stephen Gandy. All rights reserved. This means you may NOT copy and re-use the text or the pictures in ANY other internet or printed publication of ANY kind. Information in this document is subject to change without notice. Other products and companies referred to herein are trademarks or registered trademarks of their respective companies or mark holders.